Searching and enriching IOCs is a core part of the SOC analyst workflow. To streamline this workflow we have developed a Chrome extension where users can select text from any webpage they are viewing in a Google Chrome browser and query the TruSTAR platform for additional enrichment or to submit the text as a report to their enclave in TruSTAR. Users are shown a summary of enrichment available from TruSTAR. The extension will show a deep link that will take you to the graph visualization where you can conduct further analysis and review the additional context provided by the platform. User can directly download the extension from Chrome Web Store. Please follow the Chrome Web Store instructions to add extension to your browser. When installing the chrome extension through the web store users will have to accept a notice to allow the TruSTAR extension to "read and change all the data on your websites you visit". This is a broad notice from chrome to encompass all extensions that have access to data on a webpage through chrome. You can read what data TruSTAR read's from a chrome page in the FAQ section below. Please contact support@trustar.co if you need to follow this process. We recommend installing our extension from the Chrome Web Store. Unzip TruSTAR Chrome Extension.zip on your local drive. Type in chrome://extensions in your Chrome browser window. Make sure the Developer Mode box has been checked. Click on Load Unpacked Extension button. Navigate to the folder where you unpacked the TruSTAR Chrome extension and select it. You should see the TruSTAR Chrome extension installed successfully. You should see the TruSTAR logo in the top right navbar of Chrome. In your Chrome browser find an IOC of interest. 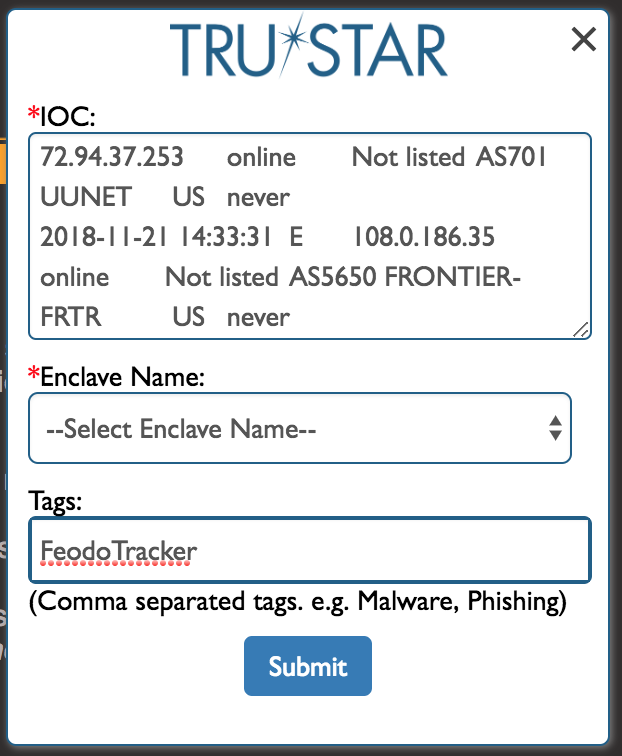 Highlight the IOC and right click on the highlighted text. In the drop down panel you will see “Search with TruSTAR”. Click on it. You will see the results populated in the extension window in the top right. 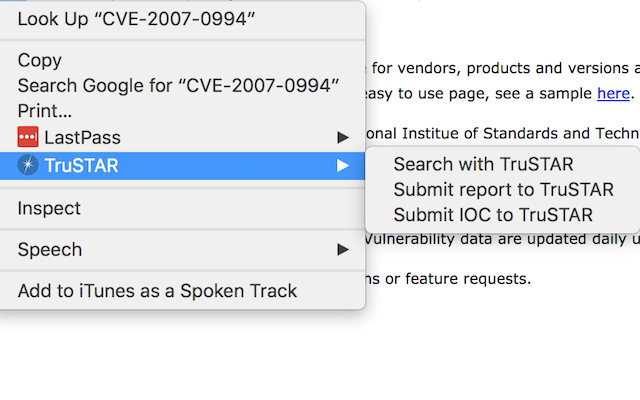 After highlighting text right click and select from the drop down panel “Submit Report to TruSTAR”. Fill out a report title. 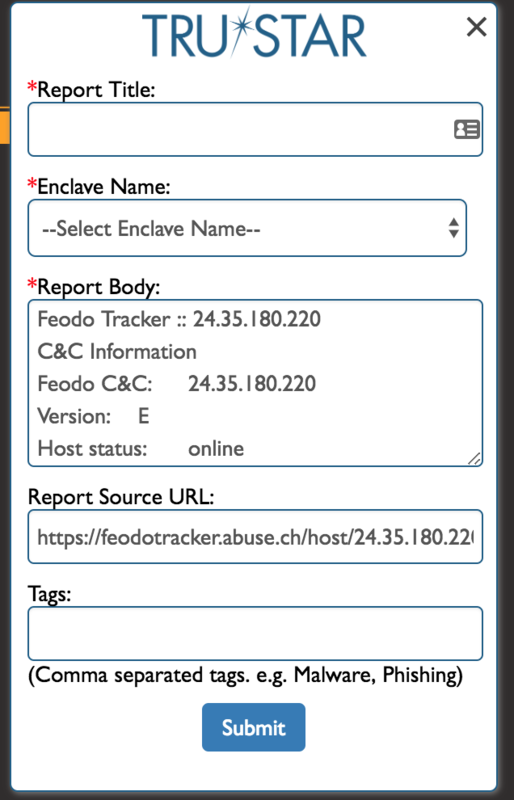 Select enclave to submit report to. Add any tags if needed and submit. In your Chrome browser highlight the text with a list of IOC's of interest. Select enclave to submit IOC list. You will further receive an email when the IOC list has been parsed and submission is complete. Click on the Trash can icon to delete the extension. Currently the Chrome extension is only capable of querying the following IOC types: IP address, URL, MD5, SHA1, SHA256, email address. A: The TruSTAR chrome plugin can only access data that the user highlights or specifically selects to send to TruSTAR. Data is not automatically collected on any chrome webpage without user approval.